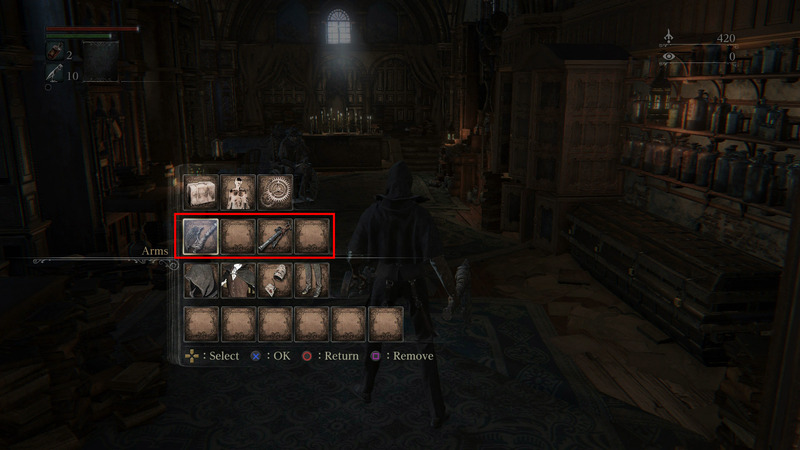 Become a deadly hunter in Bloodborne by equipping a weapon in both hands. Bloodborne is free this month for anyone with a PlayStation Plus subscription, which means a lot of new hunters are awakening in the city of Yharnam. This game is mysterious for a lot of reasons, but the first issue a lot of people will experience is figuring out how to equip weapons. So you don’t have to use your fists for the entire game, here’s the lowdown on how to use a weapon. When you first start Bloodborne, you’re not going to have any weapons; you’ll just have your fists. Once you get up from the gurney, you’ll need to make your way out of Iosefka’s Clinic and into Central Yharnam, passing the werewolf and dealing with the hostile inhabitants. Whether you make it to the lamp at the top of the ladder or you just get immediately killed by the beast, you’ll find yourself in the Hunter’s Dream. When you reach the Hunter’s Dream, you’ll see steps leading up into a building, on these steps are Messengers that offer you one of three weapons (called Trick Weapons) and a gun (used for parrying). Select whatever weapon you like the look of, along with either the Blunderbuss or Pistol. To equip the weapons you selected, press the Options button to open up the menu, and then highlight the second row. This row of squares represents your right and left hands. It’s a bit weird, but the two squares on the left correspond to your right hand and the two squares on the right are for your left hand. 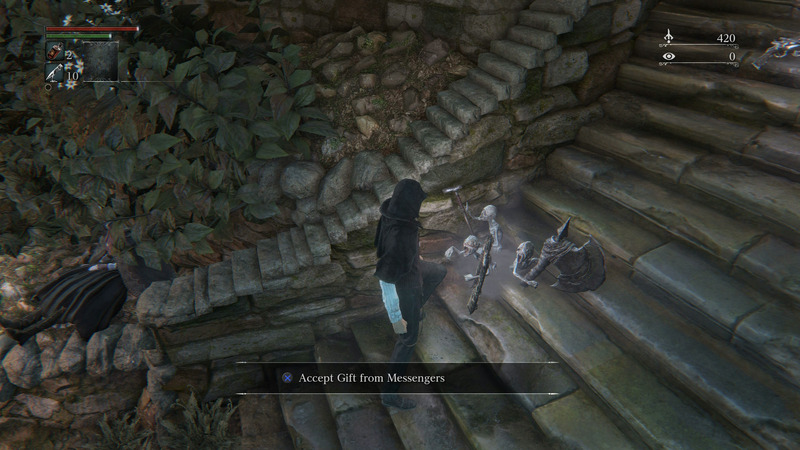 Press X on the left-most square, this will open up your weapon list, now press X on the weapon you chose from the Bloodborne Messengers. A blood mark on the item indicates it has been equipped. Press Circle to return to the previous menu and then select one of the squares on the right by pressing X. Highlight the gun you chose and press X to equip it. You should now see that your hunter has a weapon in each hand. The reason you have four squares (two squares per hand), is because you can hold two weapons, one primary weapon and an off-hand weapon. You can switch to these off-hand weapons by pressing left or right on the Dpad. Now that you’ve got your weapons equipped, you should find it a bit easier to dispatch enemies, rather than using your fists.